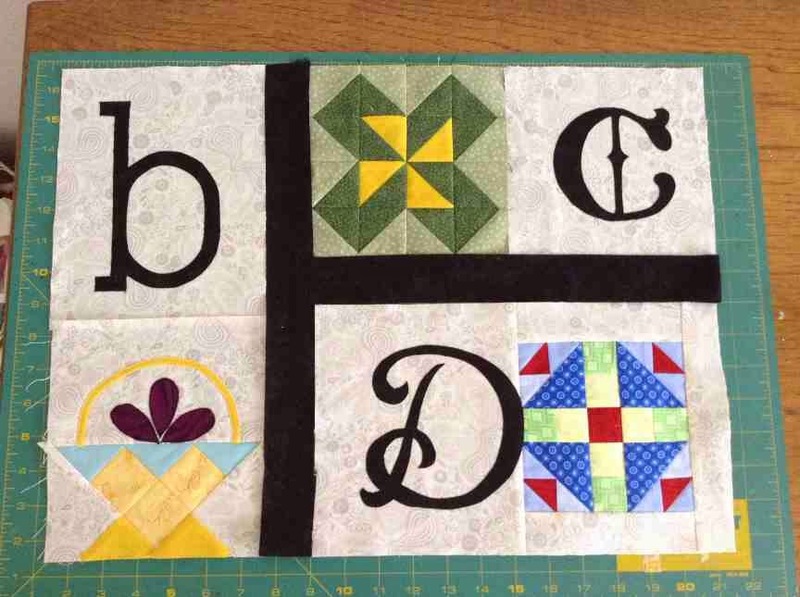 The Quilt Show's Block of the Month quilt is coming along nicely now for me. Last week, once I moved off the problem A block, I found it was easy to take one block at a time and work on it. After the slow start in January, I am thrilled at how easy the February blocks went. I really love this design. I have a week before the next blocks are published (March 1) Even then, I've decided that I won't do them for a week or so two after the instructions are released. If any problems are identified, the quilters are quick to point out errors. I had initially thought I would do the applique of the letters when I get home, since that's where my thread stash is. But since I have lots of time before I start the March blocks, I thought I'd pick up four or five small spools of colored thread and do the stitching on the fused letters. The pattern suggests that the applique stitching be done in a color that coordinates with the block. I would have done it in black so it would not be noticeable. So colored threads are a bit of a bold move in my books but I will give it a try to see how I like it. Stay tuned. Getting beyond my Mental Block! 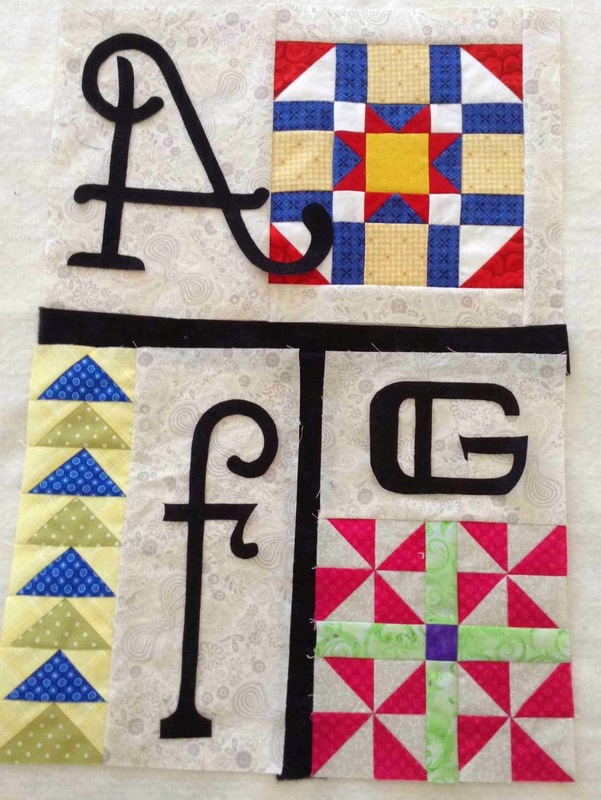 As you know, I've been working on the A - Z Block of the month project from the Quilt Show. I've been struggling with the first block - the A block. It's been a Mental Block to me.... It's been sitting on my ironing board for a couple of weeks. To get past it, I set it aside. This week, I went forward with the other two blocks that were in the January instructions. That helped. This gave me the energy to tackle the A block once again. This morning, I took a deep breath and talked myself into finishing the A block... It took 10 minutes. It's done. Yippee. What a relief. I will machine applique on the fused letters when I get home in the spring. I have a very limited stash of threads with me here in Florida. Now I can start the February blocks. I might actually get them done in February. Now this looks like just a normal day here in central Florida. The sky is blue and the temps are a nice 23 degrees C.
But when you zoom in a little closer to this picture, you will see one of the neighbourhood crocs. We see him out couple of times a week to sun himself. I thought the kids would like these backyard critters. So different from the squirrels and chipmunks we have back home. Besides the croc, we have seen a pair of bobcats, a pair of big raccoons and a big old owl! So, what's in your back yard this week? This is a test post from my new mini iPad. WhIle my daughters were here, I had fun face timing with the kiddos back home. So that prompted us to buy an iPad mini so we can continue FaceTime after they go home. Here is a fun picture of the girls taking their golf cart for a spin last evening. It was a sunny evening, so they are squinty. I'm back from our vacation from our vacation. The cruise was lovely. The new Royal Princess ship has lots of modern amenities that we love. I don't think we will enjoy going on older cruise ships now that we have recently been on two new cruise ships in the last few months. Well all that being said, we back at our home away from home, and are well back into our routine of daily exercise and eating healthy. Although, we don't dare weight ourselves until a week has gone by. This is an exciting week for us, since two of our girls are coming to Florida to visit. No kids, no husbands. They are just coming for some R and R and sun of course. They promised their kids they would not do anything fun like Legoland or Disney..teehee. In preparation for their visit, I thought I'd make some fresh restaurant style salsa using mostly local grown ingredients using this recipe. My friend Kathy F. would not like this because she has a strong aversion to it, but I just couldn't resist raiding my friends garden where I picked a big bunch of cilantro. I picked star fruit and com quoits too but that doesn't go in the salsa. The salsa is now made and it's mellowing in the fridge awaiting my visitors tomorrow. My taste tester says it's a bit spicy, but that's the way it's supposed to be.